Ever wanted to do an offshore yacht race? Now’s you chance! Here’s an excellent opportunity for people who would not usually be able to get out and race offshore. 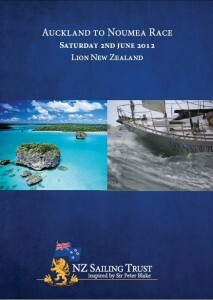 The NZ Sailing Trust are looking to enter Lion New Zealand into the Noumea Yacht Race starting 2nd June 2012. They are now looking for expressions of interest for potential crew members to join. Sail Noumea is a 900 mile race organised by the Royal Queensland Yacht Squadron (Brisbane, Australia) and Royal Akarana Yacht Club (Auckland, New Zealand). Starting in June 2012 the race will finish within the tropical waters of Noumea, New Caledonia. The Race starts from Auckland on Saturday 2nd June, and will race directly to Noumea. The race will take from 5 to 7 days to complete with an estimated arrival date between the 8th to 10th of June. On board Lion New Zealand will be an experienced crew who will host the journey and provide all safety briefings and sailing expertise. Participants will take part in all aspects of sailing, and life aboard a yacht, including sharing cooking and cleaning duties.